Plessey, a leading developer of award-winning LED technologies and horticultural grow lighting, announces the launch of its new Hyperion Inter Light. The latest launch from Plessey’s Hyperion Grow Light brand comes after the growing success of its Hyperion top light range which saw over 10Ha of grow light installations in 2018. Plessey’s Hyperion Inter Light is the perfect partner to the Hyperion top light range or to supplement existing HPS/SON-T top lighting. The Inter Light fixture has been specifically designed to provide intra canopy light from state-of-the-art LEDs for high wire cultivation of greenhouse vegetables and is installed within the crop to supplement existing top lighting. 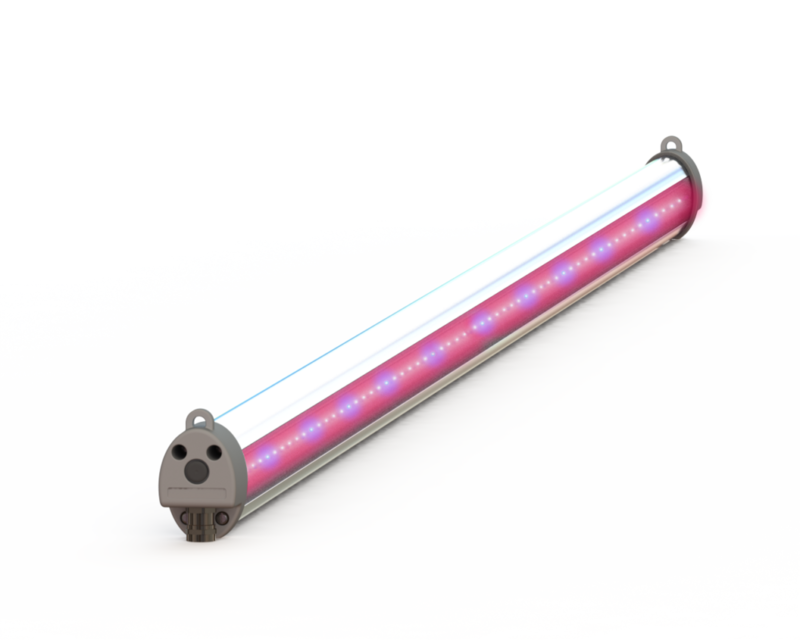 The Inter Light is suitable for use in hybrid systems with HPS and LEDs, promoting plant growth and fruit ripening speed. With a choice of light outputs and efficacy to suit different growing environments, the Inter Light also provides wide beam angle for optimum light penetration. With up to 300 micromoles/s light output and 3.0 µmol/ joule efficiency, greenhouse growers can boost production by applying the right light at the right spot with the durable aluminium lightweight IP66 unit profile. The Inter Light system comes with competitive pricing as well as an industry leading 5 year warranty. Installation is simple and cost-effective with plug and play connections, daisy-chaining up to 20 fixtures together and simple mounting on wires that can be raised and lowered. 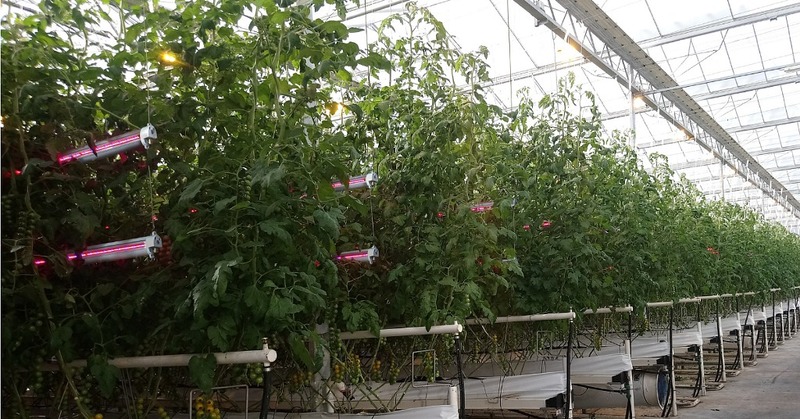 Placing additional light between greenhouse crops allows growers to achieve the maximum value and return from their production and energy costs. The Inter Light hangs within the canopy of high wire crops, providing increased light at optimised spectrums and also acts as an extra heating pipe to deliver higher yields from less energy. Adding to the success of the brand, the Hyperion LED Grow Light has just been shortlisted at the prestigious LEDs Magazine’s Sapphire Awards. The award ceremony will take place in Las Vegas on 28th February 2019. Continuing its awareness campaign, Plessey’s Hyperion Grow Lights including the new Hyperion Inter Light will be exhibited at Fruit Logistica in hall 8.1 at stand B-10 between 6th-8th February in Berlin, Germany. The Hyperion Grow Lights team will also be exhibiting at HortiContact (19th – 21st February 2019) and GreenTech (11th-13th June 2019). Plessey is a leading expert in the development and licensing of technologies that are revolutionising the solid-state lighting sector. With its in-depth understanding and breadth of patents relating to GaN-on- Silicon, the company has established itself as a valued IP partner to OEMs producing the next generation of photonics solutions. Plessey has been successfully licensing its pioneering sensor technology solutions within the healthcare and automotive sectors for many years. email sales@plesseysemi.com. You can also follow Plessey on Twitter, Facebook and LinkedIn. Combining its expertise in the semiconductor and LED lighting industry with its design skills, Plessey has developed award winning innovations targeted at variety of applications including horticultural lighting. Plessey has specifically designed the Hyperion Grow Lights to deliver greater returns for commercial growers. The Hyperion grow lights can work alongside or can replace high pressure sodium grow lights. With Hyperion you need less units for any given lighting installation than with competitor LED grow lights. Being 1:1 equivalent with existing 1000w and 600w sodium grow lights makes Hyperion easy to install and to use for growers, installers and greenhouse builders. The new Hyperion 1750 has a light output of 1750 micromole/s, equivalent to a 1000W SON-T. All Hyperion grow lights come in a range of standard and tailor-made spectrums, with a host of features and benefits designed to give a higher commercial return to growers. The Hyperion 1750 is the latest LED grow light in the Hyperion range. In 2017 Plessey announced the Hyperion 1000 with a light output of 1000 micromole/s, equivalent to a 600W SON-T.